When the original Surface Book hit the streets way back in October 2015, it took the computing world by storm. I, personally, was transfixed with the sleek machine. Now, more than three years later, it’s not hard to see the massive influence the Surface Book had on the best 2-in-1 laptops. And, with its successor, the Surface Book 2 being such a premium device, the Surface Book has a dedicated fan base that could go all way into the future. It’s a steady device that, with a constant flow of updates like the upcoming Windows 10 April 2019 Update, has been growing and evolving right out of the gate. I think the Surface Books has got to be Microsoft’s best invention so far especially with Microsoft taking the covers off its second-generation Surface Book 2-in-one hybrid, claiming it to be the most powerful Surface yet. Yes, there are some differences, but practically the Surface Book 2 will easily pass itself off as a Surface Book 1 until you turn it on. The most profound similarities are the four modes of use; the laptop mode, tablet mode,studio mode and view mode. We know the the Surface book 2 is a laptop built with power and versatility . But, we definitely can’t talk about the Surface 2 without bringing the Surface Book 1 into the mix. So we get to compare differences and so much more in this article. While the original Surface Book is still an expensive device [at £771] it’s worth it, even today. This is essentially two devices in one. It features an incredibly sharp 3,000 x 2,000 resolution display, still-6th-generation Intel Ultrabook-class processors and an Nvidia GeForce GTX 940M GPU. We’d even go so far as to praise the controversial Dynamic Fulcrum Hinge even if the Surface Book 2 made some major improvements there. The Surface Book 2 is starting out lower than it did upon release, at £1,149. It’s not going to be sitting in a sealed box on store shelves anymore, but you can find a refurbished Surface Book for as low as £849. The biggest change came in the hinge design. 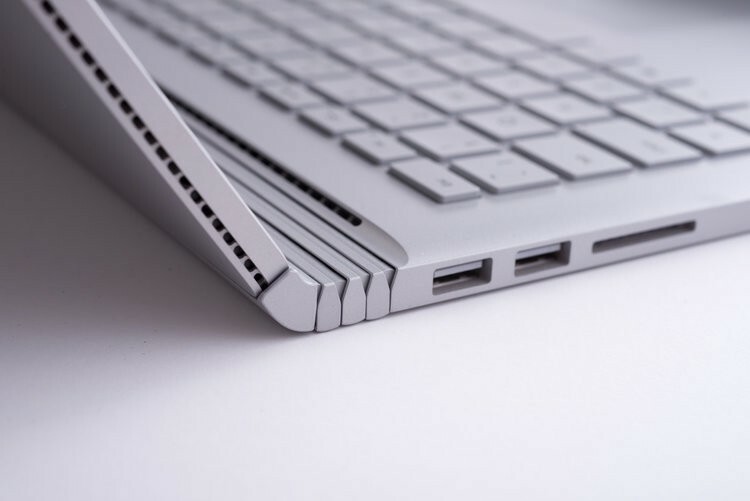 At the midpoint of the Surface Book, there’s a piece of connective tissue that Microsoft calls the ‘dynamic fulcrum hinge’. Rather than simply bonding the screen and keyboard base together, it’s this key piece that makes the whole device work. The design of the Surface Book, especially around its fulcrum hinge, remains one of the strongest aspects of the design, you can easily recognize a Surface Book while out and about and Microsoft has done nothing to alter that. The uncoiling hinge has been tweaked to be stronger yet take up less internal space, while the keyboard deck has been give a nip and tuck to have cleaner lines. The space around the camera has also been fiddled with to present less visible cutouts of the screen’s surround, while the bezel has been slimmed down but not by a drastic amount. The dynamic fulcrum hinge, rather than folding flatly, like a normal laptop, coils into itself, leaving a noticeable gap between the screen and keyboard when it’s closed. When opened, this same hinge rolls out and actually extends the base of the laptop, which in turn helps extend the support base for the tablet section of the Surface Book. A section that Microsoft calls the Clipboard. The hinge remains my favourite part of the laptop anyday, anytime! Additionally, while a traditional notebook display might weigh half a pound at most, the top section of the Surface Book weighs 1.6-pounds, because it contains all the necessary parts to act as a standalone tablet. The Surface Book with Performance Base came equipped with sixth-generation Intel Core processors and an Nvidia 965M GPU. That made it at least a generation behind in CPU power and not so significantly improved in terms of GPU power over the original Surface Book. It was a good performer, but it definitely punched below its weight class given its very high price. The Surface Book 2 changes all that. Both the 13.5-inch and 15-inch models now offer eight-generation Intel Core i7-8650U processors, with a seventh-generation Core i5-7300 option in the 13.5-inch lowest-end configuration. That means that unless you choose the entry-level option, you’re guaranteed to get the fastest 15-watt processor available today. One of the Surface Book’s major compromises has been the lack of built-in connectivity. The machine came with two USB-A 3.0 connections, a mini-DisplayPort, a Surface Connect port, an SD card reader, and a 3.5mm combo jack. In a world where USB-C is becoming increasingly important, this connectivity suite was a bit disappointing. However, the connectivity on the Surface 2 has been slightly upgraded. Specifically, the mini-DisplayPort has been replaced with a USB-C 3.1 connection. Everything else remains the same, including the two USB-A 3.0 ports, the Surface Connect port, the SD card reader, and the 3.5mm combo jack. Although, the lack of Thunderbolt 3 support is disappointing, but it’s nevertheless a welcome improvement over the Surface 1. The Surface Book with Performance Base upped the battery capacity over the original model, from a total of 52 watt-hours to 60 watt-hours distributed between the tablet portion and the base. That was good for some of the best battery life we’ve seen in a notebook, although by itself the tablet was only good for around three hours when disconnected from the base. The Surface Book 2 increases the battery life yet again, up to 70 watt-hours in the 13.5-inch and 90 watt-hours in the 15-inch model. Microsoft now estimates 17 hours total for both sizes, and up to five hours for the tablet alone. So coupled with the more-efficient eighth-generation CPUs, the added battery capacity virtually guarantees more longevity. There you have it, the Surface Books differences. So whether buying or selling a surface book, let’s know what you think and remember, your opinion is always welcome. What to do when your computer won’t turn on. Intel vs AMD: which processor is better?